Due to the holiday there is no comp class today (Sunday). Please note that we will have classes at 10AM and 5PM only for “Murph” on Monday! Partition the pull-ups, push-ups, and air squats as needed. Wear a 20lb vest if you have it. Consider scaling to “Half-Murph” if first time doing this workout: 800m run, 50/100/150, 800m run. Make recovery a priority this week. Feel free to bring a friend or come in if you are not a member as this is open to anyone daring enough to take it on! 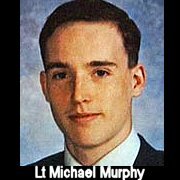 In memory of Navy Lieutenant Michael Murphy, 29, of Patchogue, NY, who was killed in Afghanistan June 28th, 2005. This workout was one of Mike’s favorites, and he’d named it ‘Body Armor.’ From here on it will be referred to as ‘Murph’ in honor of the focused warrior and great American who wanted nothing more in life than to serve this great country and the beautiful people who make it what it is. 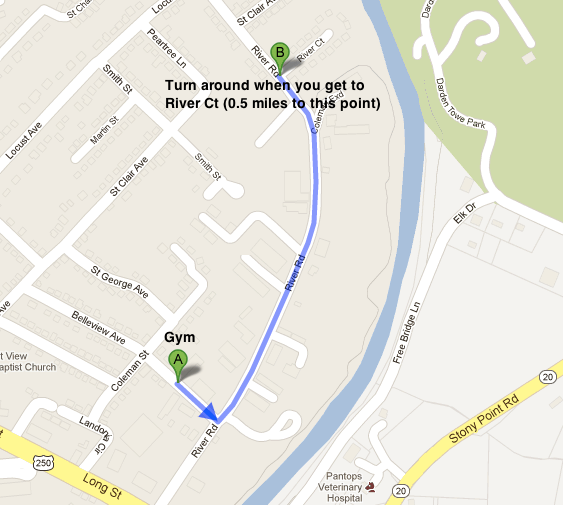 From the gym: 1) Turn left out of the parking onto Belleview Ave. 2) Turn left onto River Rd. 3) Run along River Rd until you get to River Ct. 4) Turn around and run back to gym. I didn’t time myself… But it was under an hour. I did rx (I would even say I had the weighted vest)… Until the last 4 rounds. I did ring rows. My grip went out and I couldn’t hold my excess of body weight anymore. My push ups were also probably not full depth. I didn’t want to give out and fall on the belly. 44:28… improved my time from last year by 5:43.